What will you prove this January? 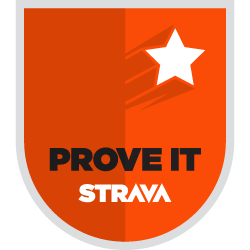 This month, we’re challenging every athlete on Strava to prove something. Start the year off strong, and let January set the tone for the rest of 2014. Set yourself an ambitious goal and prove you can stay consistent throughout the entire month. Prove you can persist, riding day in and day out. Prove you can endure, skipping zero workouts. To keep you motivated along the way, there are four milestone achievement badges to be earned. They start at 150 km and go all the way up to 600 km. Make it to the 600 km milestone and you will unlock the ability to purchase an exclusive Prove It Challenge Tee. We’ve seen what our cyclists are capable of, and we’re impressed... but we know you can do more. Prove that you and your fellow cyclists can make this the biggest Challenge we have ever seen by collectively riding more than the previous record of 46,453,244 kilometers. Regardless of the weather, the time of year, or your other commitments, get out there this January and prove that no one loves riding more than you do. Ride 600 kilometers or more during the Challenge and you will unlock the ability to purchase a limited edition Prove It Challenge Tee. At the end of the Challenge period, qualifying cyclists will be sent an email which will include a link to purchase the Challenge Tee. A 'Place Order' button will also appear below the Tee on this Challenge page as well. The Tee will be available to purchase until 11:59pm Pacific Time on February 16th. Orders will ship 2-3 weeks after this purchase window closes. All activities logged during the Challenge period must be uploaded to Strava no later than February 3rd, 2014. Ride hard, and be safe.